MIAMI (CNS) — A weakened Hurricane Irma churned in Florida after ripping through southern portions of the state and the Caribbean islands, flooding cities, knocking out power to millions, destroying homes and businesses and killing more than 20 people. The massive hurricane, which dwindled to a tropical storm as it neared the Florida-Georgia line early Sept. 11, was forecast to die out over southern states later in the week. Officials in Florida and across the Caribbean, meanwhile, started to dig out and evaluate the full scope of the disaster Irma left behind. The strength and size of the storm, with 120-plus mph winds stretching 70 miles from its core, left hardly any place near its path untouched. It leveled entire islands in the eastern Caribbean, snapped construction cranes in downtown Miami, and brought unprecedented flooding on Cuba’s north coast. By the evening on Sept. 10, roughly 5.7 million Florida residents were left without power. Aerial footage showed large swaths of cities like Miami and Naples, on the Gulf Coast, under water. State officials had ordered 6.3 million of the state’s approximately 21 million residents to evacuate; many headed north to stay with relatives. 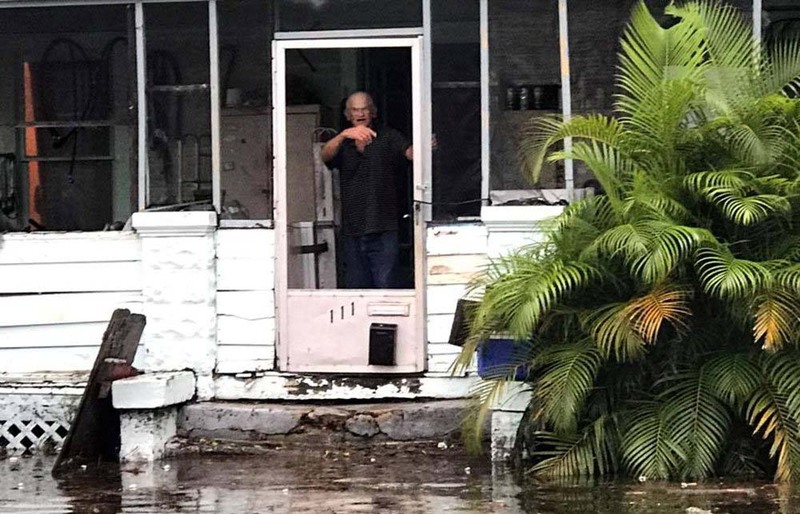 “Millions of Floridians are being impacted by this storm,” Florida Gov. Rick Scott said during a news conference Sept. 10. Earlier, the president of the U.S. Conference of Catholic Bishops called for prayers for all those in the path of Hurricane Irma. The cardinal noted that, as with Harvey, the bishops’ conference would work with local dioceses, Catholic relief agencies and other groups to offer assistance. The storm had already left a path of destruction in the Caribbean. Disaster risk analyst Center for Disaster Management and Risk Reduction Technology, based in Germany, estimated more than $10 billion in damages in the Caribbean, making it the costliest storm ever in the region. The Netherlands estimated that 70 percent of the houses on St. Martin were badly damaged or destroyed. That left 40,000 people in public shelters as Hurricane Jose approached. The Pentagon mobilized the military to respond to the U.S. Virgin Islands, where at least four people died and devastation was widespread. In Antigua and Barbuda, Arthur Nibbs, minister of Barbuda Affairs who was on Barbuda when Irma hit, said it was the worst storm he’d ever seen. “It was enormous. There’s nothing that is comparable. It destroyed everything that was in its path,” he said. Nibbs said roofs were torn away, trees were toppled, government buildings were destroyed, and cell towers were snapped in half, leaving the small island of about 1,600 people without any form of communication. Officials scrambled to evacuate the island before the arrival of Hurricane Jose. The category 4 storm veered north of Barbuda, sparing it from a second direct hit.